Ice cream sandwich and a donut for lunch! Wow! Great times in the Virgin Islands! We stayed overnight at Honeymoon Bay on Water Island – right beside Charlotte Amalie. 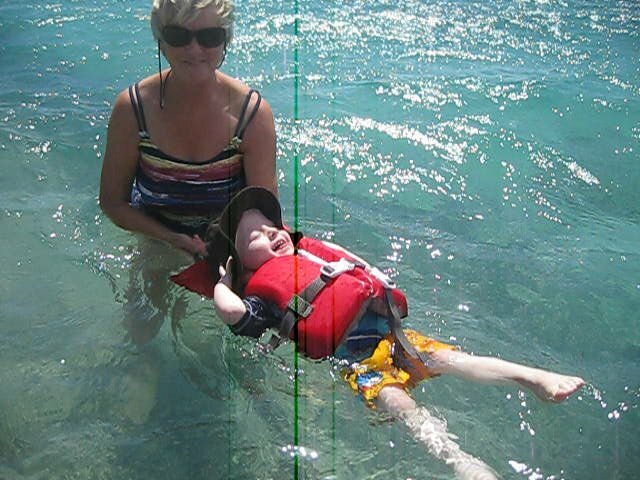 Jack was crazy in the water – running in until he was over his head and then floating on his back. In the morning we headed 1.2 miles over to Lindbergh Bay so Jen, Pam and Jackson could walk to the airport to get Luke. Glen stayed on the boat to do important tasks and not drink rum. In less than an hour – and much less than 4 ounces – Luke was on the boat and we were heading back to Honeymoon Bay. Great place for all of us – but especially Jack. We think it was a good start to Luke’s vacation. So the parrot said... "OK, I give up. Where did you put the boat? We are into new cruising guides now – not territory we’ve read much about. We stopped at Christmas Cove on St. James Island after cruising through past the big cruise ships in Charlotte Amalie. Great snorkeling, according to Jen and Luke. We took Jack to the beach to review throwing rocks. He did pretty well, although he almost nailed his own foot a couple of times. Left Xmas for a morning in Cruz Bay. Found two new kinds of rum to buy. Then onto Francis Bay. More beach, more rock throwing, back floating and running into the waves. Jack did stuff, too. Holy Crap, Gran. You should see all the food under your bed! We are in Francis Bay on St. John planning a brief tour of the BVI and then a quick trip back to St. Thomas to ship the Closs family off for their return trip home to Vancouver. WOW, you guys have the best trips with your family! These photos show the joy. Congrats on a great trip and arriving the USVI and BVIs!!!!! What a great adventure for a little boy!! .....as well as his Nan & Papa....oh, of course, Jen & Luke & the Little Missy. Cannot believe your weeks have gone by so fast. We loved looking at Jack's photo op.